Whelp, there they are - my first pair of knitted mittens (rav link). I'm so glad to have them done. Not because they were terrible to work on (because they weren't), but because I was so excited to see the final product. The thinner yarn I chose actually worked out really well because they fit nice and snug. I'm sure a thicker yarn would have been fine, but my wrists are so tiny that I'm afraid they would have been too big. 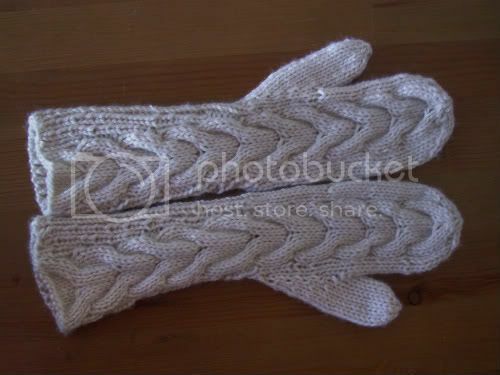 These are perfect for winter driving, and I can also be somewhat mobile with them, which is something I can't do with my store-bought mittens that are cute, but huge and clumsy. They're warm enough, though I'm not sure I'd clean snow/scrape ice off my car with them. 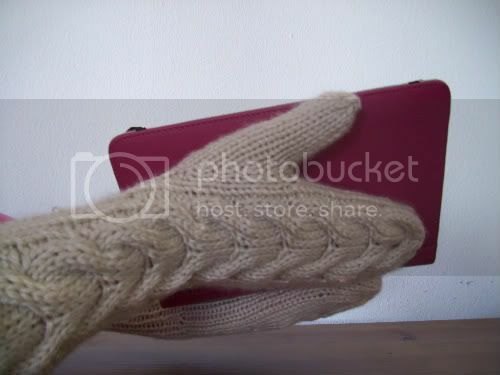 For that, I should probably knit some gloves with a lining inside. I had found a cute pattern awhile back and added it to my Ravelry favorites, but now I can't find it. Guess that gives me more incentive to organize my queue for the HPKCHC challenge. Which, by the way, these mittens are also my first finished project for that, so yay me! They say people get really addicted to socks - I think gloves are my calling. Last night, I started another pair of gloves (well, fingerless mitts) just because I've recently found a use for them. I keep meeting people who say they look hokey, tacky, like something a homeless person would wear, etc. But whatever. When it's cold in one room of you apartment, but sweltering in another, just put on a pair of these and you're golden to go about your activities. In other news, I've created a gallery on my Facebook Fan Page. I have so many more photos to upload, but didn't have the energy this weekend to crop them all and make them look nice, so these are what I already had done. I'll be posting updates on the most recent FO's this week, too. Sigh... I should really make some more inventory for my shop, considering I have nothing. But I'm taking a short break and concentrating on stuff I've really wanted to make for awhile. Plus, I'm participating in a swap right now that I'm really excited about. We have to make stuff pertaining to our spoilee's favorite holiday, and my spoilee's favorite is Halloween (yay!). It's always fun to make some different things for a change, and I love how these groups I'm in have been challenging me and getting my mind off looking for houses, applying to grad school, and all that other junk. Apparently repetitious counting keeps me sane. Older PostATTN: B&N - Where are your knitting/crochet calendars? !